In August 1972 I was living and working in Cairns North Queensland and I decided that I wanted to see Australia. I had had enough of working for a weekly wage and I had decided to travel and work along the way. Of course, back then there was plenty of work to earn a living whilst travelling, so I resigned from the railways and started planning. 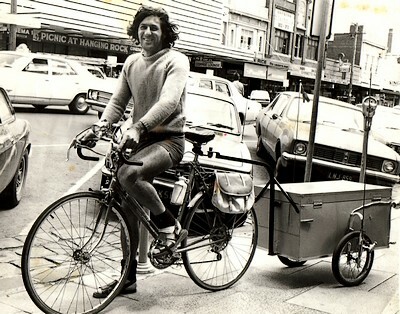 The first thing I did was buy myself a pushbike and I built a trailer to attach to the bike (as the photo show). When that was all done I was off southward from Cairns (3rd August 1972). Now I am 63. I have retired and would like to travel around Australia again, not by car, train or bus, no. Six of us are planning to travel by using camels and gypsy type of caravans. We have two so far, and are looking at two more here in South Australia. We are also checking out a camel farm here near where I live. This is going to be the best holiday we all will have. I have planned this trek for a very long time. I just hope that now I can get it off the ground and get on with it. Much of the road between the two places was still unsealed. They could not purchase a new motor for the car in Darwin and the cheapest motor was in Adelaide. It would have cost them too much to have the motor sent to them in Darwin, so they chose camels. Their story was never published except in newspapers along the way. (I have been trying to track down these papers, so far nothing.) Meeting the family and listening to their story has really inspired me to get out of the township I live in. I am sick of paying rent and other bills. I am now on a pension and get paid each and every fortnight so I don't think I will be needing money along the trek. I haven't seen much of my own country as you have. Where you live, many Australians wouldn't even know where that is. They don't know what's just around the corner from where they live. Many people take holidays and end up at the same place year in and year out, and many holidays are by far too expensive. Australia has so much to offer anyone who is willing enough to go out and live their dream of travelling, and there are so many different ways it can be done. As for me, nothing is in detailed planning stages,yet. I only have the idea. No dates have been set as yet, but I will contact you when a date has been set. Haven't got a clue when you wrote this article, always wanted to do similar? So what's happening with this trip eh?? Drop me a line if you are interested, or have any advice. Camels are the most comfortable way to travel - I've tried in Egypt - but they are not the most hospitable creatures and they smell at both ends! How do you plan to get them and you comfortable together? 11th Feb 2010. Sounds like a very boisterous adventure with lots of opportunity for great hilarity...but dates would be good to allow people to know more. Sounds like a good idea to me. So how do we who are interested in this wonderful, mad expedition encourage you and come along for the ride? I just need to hear gypsy and camels and I'm in. Let us know when it's happening. Hopefully really, really, really soon. Kevin's original message is over a year old. Seeing the renewed interest I have tried to contact him but haven't been able to. I have been travelling using camels since 2003 and my website at: www.australiancamels.com is a must to see for anyone wanting to travel with camels. Don't be misled. Camels are gentle, intelligent, and very misunderstood. I have designed a course in camel handling and expedition work with camels. To my knowledge it is a first in Australia and unique to the world of camel travel. What I love about travelling with camels is that you can go to places where 4x4's can't. During my time travelling I know I have been to places where no-one has ever been before. Check out the website and enjoy your camels. If people cant contact Kevin, then try getting in touch with a Ken Tuckey at Coolah NSW. Ken was an alternate bushy person who lost his wife to cancer and became quite depressed. So he took off from his farm and went to Central Australia where he bought several camels, lived with them for some months and then walked them back home to Coolah over a couple of years meditating. He now runs his farm and Camel trips from Coolah and regularly goes to well out of the way places. I lived with an old camel drover for a while back in about 1973 in West Australia when traveling, and the stories he told were amazing. The female camels are good to ride on but the males can be a bit cranky especially if there is another male around or the females are on heat. Riding them depends on the type of saddle you have and these can vary a lot. P.S. Watch out in front too as they can spit the foulest globule several feet and usually at you if you offend them. SA to WA by my 30th birthday! I have a similar dream. To travel by camel from SA to WA by the time I'm 30. I only have a year and a half left to get it organized. I have never been much of a planner, so any advice on where to even begin with this adventurous project would be greatly appreciated from anyone. If you are thinking of trekking with camels, I have a few for sale. Contact me on this number 0402966028. There is a woman named Alison in Broome who has a camel tour on the beach. She is "THE" original camel woman. If you get in touch with her, you'll find out that she has lived in the desert for years with camels and towed caravans with them. She knows everything; which desert bushes are good or bad for camels to eat! I think her business in Broome is called "Ships of the Night". I haven't seen her for several years but I think her camels have the blue blankets under the camel seats. She is "THE BEST" person to get in touch with because she really loves her camels and cares for them very well and has had a wealth of experience living outback with them! Yep we want to do this too. We are currently in NZ and are bored s.....less with the conventional life. We've decided to try and find someone in Australia who can build us a simple and light horse drawn wagon we can live in. So anyone out there who can help we would love to hear from you. You can contact us on 108bankei@gmail.com. Hi, when was this article written? Are you already travelling? Would love to "follow" your adventures. I have a gypsy caravan and want to join in. Has this epic journey already happened? Anyone want to join me on a new trip if it has? I got the same plan except I use a 4wd tractor which has got 150hp.